Operation Hammond offers a range of services, and training for pop culture conventions, events, and associated organizations. We provide convention first aid serivces, and more. We are experts in the unique needs of the pop culture/nerd community. Our aim is to work alongside event staff in order to seamlessly integrate our services. Most of our members are fans themselves, or have a deep love of pop culture, and enjoy helping out conventions, and events. None of our members are financially compensated for their work or time. Each of our members volunteers their time, and skills for the betterment of the fan community. We can assist your convention, or event in many ways. As the country’s premier social medical service, we offer a wide range of services that can be customized for events large, and small. We carry our own insurance to operate fully as a medical organization in all 50 states, and Canada. We are very flexible when it comes to payment, and fees for our services. For more information about our funding, and payment model please visit our Funding model page. If you would like us at your Convention, Event or Show please fill out our Services Inquiry form. Operation Hammond offers a wide selection of services and training options for pop culture conventions, events, and associated organizations. We are experts in dealing with the unique needs of pop culture conventions, events, and shows. Our aim is to assist, and in many cases join, convention/events staff and seamlessly integrate our services. The majority of our members are nerds themselves and share a deep love of pop culture and a passion for helping out pop culture conventions and events. We bring significant resources and equipment to each event we do. All of our First Aid Services are authorized and quality checked by our Chief Medical Officer who is a board-certified emergency care physician. We draw from broad and diverse experiences in convention staffing, event/convention operations, emergency preparedness/training, event medical care, crowd/line management and more. Our members have years of experience staffing pop culture events and conventions. Many of our members and senior staff report from a variety of backgrounds ranging from EMS, police, social services, healthcare, customer service, hospitality, convention staffing, public relations, security and more. Operational Response & Convention First Aid Services– This is the side most people know and is our largest arm. 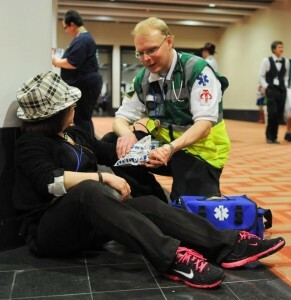 Our core service is providing first-aid level medical services for conventions, shows, and events. We have all the equipment and experience to provide advanced first aid response services for conventions/events from 10 to 29,000+ attendees. Our medical staff is trained to a minimum of First Aid/Advanced First Aid and CPR. Many of our members hold certifications of Medical First Responder or higher. Our First Aid response services include Automated External Defibrillators (AEDs), medical grade oxygen equipment and the life-saving opioid overdose medication Naloxone in addition to standard first aid gear. We operate at the Basic to Advanced First Aid level as outlined by the American Red Cross and American Health and Safety Institute. We carry our own radio communication equipment, but we will gladly work with your radio systems if desired. We carry our own medical liability insurance that allows us to function as a First Aid organization. We can tailor our services to your convention/show requirements. Training– Our training and professional development are unique. 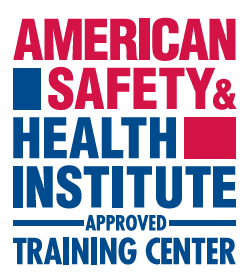 We are a Licensed Training Partner with the American Red Cross and American Health & Safety Institute training center. We teach First Aid and CPR specifically for people that staff and attend pop culture conventions. We are the only organization teaching First Aid specifically for people who staff and attend nerd and pop culture conventions. We do many unique, fun-filled and informative panels pertaining to safety, well-being, and outreach. Social Care and Outreach– This is an area most conventions and events don’t do or if they do it’s very limited. Every year at conventions, many incidences of sexual assault, bullying, and abuse go unreported and unresolved. Operation Hammond’s social care and outreach are dedicated to assisting convention attendees with dignity, confidentiality, and compassion. Our social care and outreach offers basic first-aid to attendees in sensitive situations and provides support from first-response to reporting such incidents to authorities. We guarantee privacy and respect all decisions regarding care and follow-up. We invite you to request our services no matter the circumstances. Emergency Preparedness and Organization- We have extensive experience with emergency management and how it pertains to nerd and pop culture conventions/events. We have been consultants for many conventions and events across the country. We can run panels and events geared for nerds and convention staff on how to prepare and deal with every day, or once in a lifetime emergencies. We are experts in implementing and training others on how to deal with situations and emergencies that pertain to pop culture conventions and events. Emergency management planning is essential for any event, large or small. In the event of a large or small-scale emergency, conventions and events must be prepared and ready. Proper emergency planning and management mitigates risk and has been proven to save lives. A short YouTube search for the terms Station nightclub fire or anime fire alarm will quickly underline the importance of proper preparation.